A flash drive is similar to a hard disk, which is used to store digital data such as photos, videos, presentations, and other important documents. Under normal circumstances, when plugging in USB flash drive to your Mac’s USB port, you will see it mount on Mac. If not, then you get into an annoying trouble. USB flash drive not showing up on Mac is a problem that freaks many users out. Today, we will expound the methods to solve USB flash drive not detected or recognized issue, as well as how to recover data from USB flash drive. >> Why is USB Flash Drive Not Detected or Recognized on Mac? >> How to Fix Flash Drive Not Showing up on Mac? >> What is USB Flash Drive? 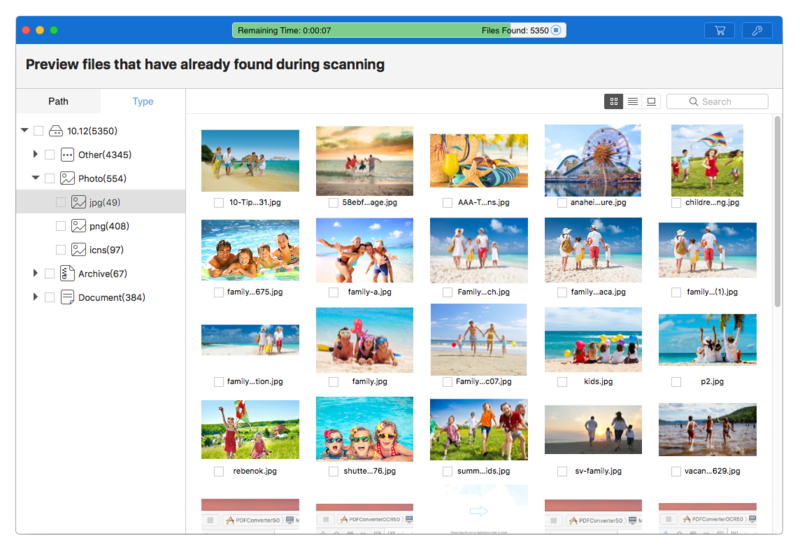 Recover all sorts of your files, including photos, videos, music, emails, etc. Recover most types of files, like AAC, M4A, MP4, Pages, PDF, HTML, etc. Why is USB Flash Drive Not Detected or Recognized on Mac? There are several root causes that would lead to USB flash drive not showing up on Mac. When you are stuck on the undetected USB flash drive, investigate each of reasons. Most problems of flash drive can be solved effortlessly. How to Fix Flash Drive Not Showing up on Mac? According to the reasons, you can find the corresponding solutions. The following methods can solve most USB flash drive not showing up on Mac issues. Give them a try before you buy a new USB flash drive or upgrade your system. The damage of USB device would cause flash drive not showing up on Mac, particularly if you’re using a cheap and low-quality product. As for USB ports, they can become dirty and worn over time. Go to Finder menu at the top of the screen, and choose Preferences option from the drop down list. Tick External disks option on the General tab. Swift to Sidebar tab, making sure External disks option is selected under Devices. These steps are very important. If you haven’t ticked the option, flash drive would not show up on desktop or Finder. Why USB flash drive is in Disk Utility, but it’s unable to mount and be recognized? Why my files can’t be copied to flash drive? Obviously, you encounter disk format problem. If your USB flash drive is used for both Windows and Mac computers, the HFS+ and NTFS formats are not applicable. HFS+ can’t be recognized on Windows, and NTFS format can only be read (unable to be written) on Mac. FAT32 and exFAT supports both of them, but FAT32 has a limitation of file size. Therefore, exFAT should be the best choice. Re-insert flash drive into a USB socket. Launch Disk Utility software on your Mac. Select ExFAT from Format dropdown menu and type the name. Click on the Erase button. You will see a confirmation window, just hit the Erase button again. Then, the formatting process will be started. Many authors are recommending to reset NVRAM or PRAM, but it does little to help. The method mainly solve some basic problems, such as wrong time, question mark icon, strange mouse scrolling speed, etc. When resetting SMC, you can fix external devices are not recognized and USB ports are not working issue. Remove the USB flash drive. Press and hold Shift, Control, and Option keys on the keyboard. At the same time, press the power button. Hold all the keys down for 10 seconds. Release them and restart your Mac. Insert your USB drive and check whether flash drive not showing up or recognized on Mac issue fixed or not. Reconnect the battery and restart your Mac. Re-insert flash drive to USB port. Unplug all USB devices and shut down your Mac. Press the power button 5~6 times to completely release the static electricity of the motherboard. Reboot your Mac and insert all USB devices, including USB flash drive. Navigate to Applications > Utilities > Devices. Click on Devices tab and choose “Ask me what to do” option. Turn to Devices menu > select External Devices. Connecting USB drive manually may solve the flash drive not showing up or recognized problem on Mac. You can open Disk Utility app to check if the USB flash drive is showing up. There are two situations. If your flash drive is detected, but you still have the trouble accessing the content on the drive, you can run First Aid: click on drive > hit First Aid > run the process to repair the error on the drive. If your Mac won’t recognize the USB flash drive, I suggest you to unmount the disk: Click on Unmount button > unplug the flash drive > wait about 10~15 seconds > plug flash drive back in. Next, try to access the flash drive again. Do you think this is over? Even if your USB flash drive not showing up on Mac problem is solved, there are still some important things to follow, like recover accidental missing data on flash drive and remove a flash drive safely. Formatting USB flash drive will erase all items stored on it. Even other solutions to fix flash drive not showing up on Mac could also result in data loss. If you lost some vital files and forgot to back up them previously, a flash drive recovery is needed at this time. Cisdem Data Recovery for Mac is considered as the top one option to help you retrieve data from USB flash drive. It can quickly detect, preview and recover missing, formatted, deleted data. 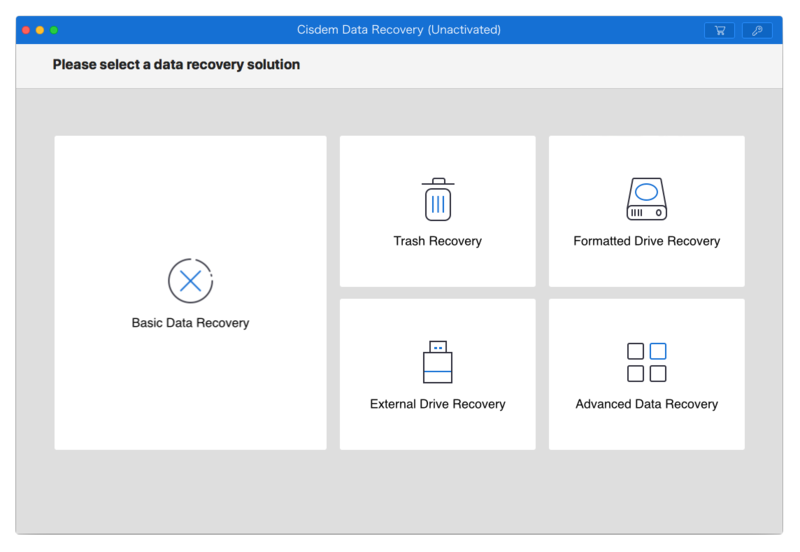 Besides supporting hard drive recovery, it offers comprehensive recovery from multiple devices as well including USB flash drive, SD card, SSD, MP3/MP4 player, Cameras, HDD, CD/DVD, etc. Note: Since the recovery will be performed on Mac, please make sure you have successfully connected with your USB drive without failure of “flash drive not showing up on Mac”. To recover lost data from a USB flash drive, I recommend you choosing the option of External Drive Recovery mode. Advanced File Recover mode is also feasible, but it takes a long time to scan the whole lost data. As for Basic Data Recovery mode, it works for recovering photo, video, audio, and document, excluding some unneeded files, like configuration files. This flash drive recovery will list all logical drives on your Mac, including hard drive and external devices. Select your USB flash drive which on the list, and click on Scan button to start the scanning process. After the scan, all lost contents on USB flash drive will be displayed according to file category. You can preview and check file validity before recovery. In addition, you can start a quick scan to search your target files that were lost. Finally, choose the files you intend to recover, and click on Recover button to retrieve your lost items on USB flash drive. Right click the USB flash drive and choose Eject. USB flash drive can be referred to as USB drive or flash drive for short, and there are various other names called pen drive, keychain drive, key drive, thumb drives, USB keys, memory key, etc. It’s applied to transport files from one USB-equipped device to another and backup or store data. Documents saved on flash drive are not affected by many external factors, like scratches, dust and magnetic fields. However, these are serious problems in older portable storage devices such as floppy discs. Meanwhile, flash drive has a relatively large storage capacity. The maximum capacity has reached 1T, which is equivalent to the capacity of 240 DVD discs. For more detailed introduction, you can visit wikipedia: USB Flash Drive. As USB flash drive brings so much convenience and is used frequently by us, issues tend to occur beyond our expectations. Finishing reading this guide, you will never worry about “flash drive not showing up or recognized on Mac” problem. The possible way to avoid troubles is to eject USB flash drive safely, keep backing up important data and install anti-virus software to ensure the security. If you think these are not enough, the safest insurance is to install a USB flash drive recovery for Mac tool. Find and remove duplicate files on Mac. Recover deleted or lost iPhone data without backup. How to Do the SanDisk Recovery? On the business trip, store important files in laptop is not the first choice, instead with storing them on memory card or flash drive are very convenient. With more files stored on the SD memory card or flash drive. If we deleted the necessary files by mistaken will be so troublesome. Here, we will introduce three ways about how to recover files on the SanDisk card with best data recovery software. This guide outlines the instructions to restore from Time Machine backup and perform data recovery on Mac if you get Time Machine backup error. Here, we will introduce the ways about word document recovery what includes how to recover unsaved word documents and recover deleted word documents on mac.